I would first request to please be unbiased and put everything you know of Anekantvaad aside. I have seen many people giving different explanations for Anekantavada. But the story of “the elephant” is universal with respect to anekantvad. According to me, the explanation of anekantvada given by some has no relation with the story of the elephant. So I would like to put my viewpoints on Anekantvada here with the help of that story. There were 6 blind men who had never seen anything. They just visualize thing by the perception they get by touching them. One day an elephant came to their village. All were very excited to know about the elephant. They all touched different parts of the elephant and deduced how the elephant looks like by the perception they got by touching the elephant. So all the 6 had a different perception of the elephant. One of them touched the tail of the elephant and thought it is similar to a rope. Similarly who touched the stomach felt it is like a wall. The one who touched the leg thought that the elephant is like a pillar. The one who touched the ear felt it is like a fan. The one who touched the trunk felt it like a snake. The last who touched the tusks felt it like a spear. Then all the 6 started fighting and saying his perspective is right and others are wrong. So they all visualized the elephant differently. 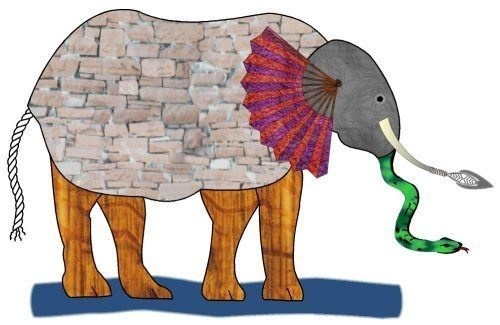 If we combine all the 6 the elephant would look like this. Then a wise man with the ability to see came to them. He told them that all of them are right “in their perspective”, but none of them is totally correct. One of them is right and one of them is wrong. One of them is partially right and other is wrong. Some people can ask if a person is killing beings, how can we apply Anekantvada there? Answer: The person may be right in his perspective, maybe he is a devotee of Kali and he is taught that Kali wants sacrifice. He is right in his own perspective, though he is wrong. let’s create sub-cases here too. A. A brahmin says that Kali is like our mother, but it is not good to sacrifice animals. Here 4 case is applied. The person doing the sacrifice is wrong and the brahmin is partially right. He is right as he said, killing is wrong. B. A Jain muni says Kali cannot do anything and killing is absolutely wrong. Here case 2 is applied. The person doing the sacrifice is wrong and the Muni is right. The aim of Anekantvada is that to teach us that others “may” also be right in their perspective. This concept is widely accepted, it is also covered in the syllabus for UPSC, SSC, IAS, NEET etc. Significance: This concept is used as a tool for non violence. By knowing that others may also be right in their perspective, sheds our “Kashayes” and it will reduce violence. Criticism and questions are welcomed. Please do read this and give your view points on this. Everything is right if it is from heart. And all truths are lie if said for selfish purpose. No one can describe the absolute truth in words, no one. It can just be felt to self. If someone is killing animals for Kali, he may be very right in a way that his brain sees sacrificing animals as a tribute to Kali, i.e. his brain perceive this act as positive notions in his subconscious. He may not be able to see the pains of animals but he could have happily feeling a gift to his mother, a devotion. You gave example of Alarm in some previous question, here too, ringing of alarm can be seen as probability function. It can rang no matter how hard you try to stop it ringing, at least in probability. There is probability of everything in this Universe, so nothing is right and nothing is wrong, it is just our intention that makes our perception of being a good karma or bad one. Instead of trying to find the truth, we should just observe what things are without any preconceived judgement, and try to see our ignorance that we are capable of doing something in pudgal. Do Nothing, No suggestion, Be happy. 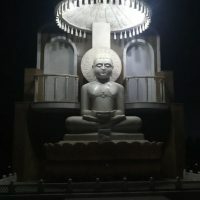 Let us first discuss anekāntavāda as perceived by Jain scriptures. Will then discuss accordingly. I have a problem with this. If we look carefully at the statement given by each blind men, say, for instance, ‘it is (like a) wall’, what is the reference point of the word ‘it’ ? are they referring to the elephant? are they talking of parts of elephant? If the latter, then all are absolutely correct. There wouldn’t have been any disagreement. 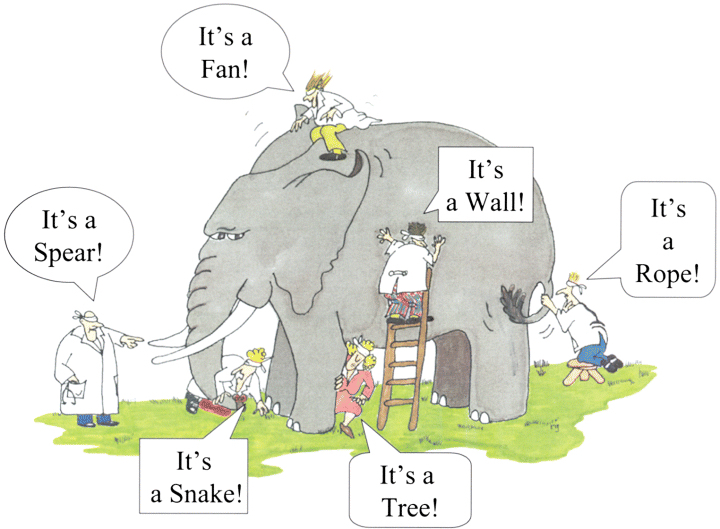 If the former, then upon combining the perspectives of all six of them, we would get six elephants and not one elephant. He told them that all of them are right “in their perspective” , but none of them is totally correct. They are not even partially correct. If this is the case, we need to rethink what the doctrine of anekānta exactly means. P.S. - This answer requires formatting. Will edit soon. Let us first discuss anekāntavāda as perceived by Jain scriptures. Can you please share some Jain scripture written by some Muni which clarifies it? I wrote, As perceived by me, as at that time, I was not completely sure about that. But after getting the point of view of other people of many sects of Jainism, it is not only “perceived by me”. what is the reference point of the word ‘it’ ?